Vintage Skipper doll is 9 1/4" tall and is Barbie's little sister. She made her market debut in 1964 along with Ken's best friend the Allan doll. Skipper has her own wardrobe that she shares with her same size friend Skooter, also vinyl cases, transportation, house's and accessories. 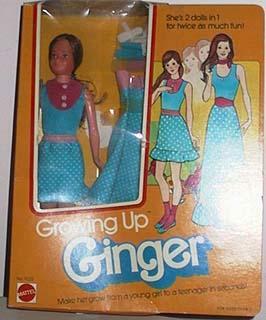 The Ginger doll was introduced in 1976, see below for more details. 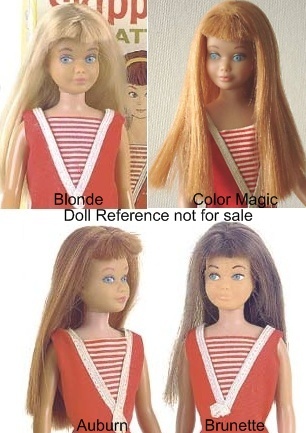 Skipper doll has painted blue eyes, coral lips and long straight rooted hair with bangs; blonde, brunette or titian; variations are; pale-lemon blonde, reddish-auburn, two-tone brunette (which is usually very heavily rooted) and straight non bending legs. Swimsuit is one piece red and white cotton, brass headband, red flat shoes, a black wire stand, white comb and brush. White booklet cover. 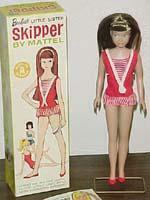 Doll mark: Skipper © 1963 Mattel, Inc. This Skipper doll was exclusive to the Japan market, is the same as the U.S. version except for her unique eyes - which glance to the left, are dark brown and the Skipper name was left off the doll marking. Came in the same hair color variations as the USA marketed doll. Doll mark: © 1963 Mattel, Inc.
0950 Skipper doll straight leg hair colors are; Blonde, Color Magic carrot orange, Auburn and Brunette, (with variations within the hair colors) the scalp is also painted to match the hair color of the doll. New pinker skin tone, rest same as 1965. HTF - 0950 Skipper Color magic hair - These dolls must have come from around 1966 when Color Magic Barbie's were introduced - it has brunette hair that by now has oxidized to a carrot color, also has a orangey painted scalp. Information is from the book "Skipper, Barbie Doll's Little Sister" by authors; Arend, Holzerland & Kent, and has a nice photo of all the hair color variations. Re-Issued (Japan) pinker skin, new clear plastic "X" stand, new art work on box with 1970s fashions, PJ replaces the Midge doll on box & Barbie is in a TNT swimsuit. Same markings and stock No. as 1965-1968. Same long straight hair/bangs. (blonde, brunette, or titian). New swimsuit is one-piece blue, red & white stripe inset with a blue anchor, red flat shoes, brass headband, white brush and comb, gold wire stand and booklet. Same as 1965, but with the new pinker skin that all Skipper & friends were made from, often called "Mod" skin tone. Same mark as above. Same as 1966, new box lime green, one piece cardboard box with clear cellophane front. New artwork on box of later 1970s fashions. New rooted eyelashes, one piece blue, pink stripe swimsuit. New twist n' turn waist, new box and graphics hair colors are; ash, pale blonde, titian and brunette. Faces have vivid face color. Accessories are; white comb and brush, black eyelash comb, clear X stand, turquoise headband, swimsuit and booklet. Later issued were marked Made in Taiwan, same doll, clothes and hair. Made in Taiwan and marked as such, new two sausage curled hair-do; Golden blonde or Java brown hair color, rooted eyelashes, one piece red, orange checked, solid orange bottom swimsuit, orange hair bows, clear X stand, white comb and brush, black eyelash brush. Same mark as late 1968. Doll mark: © 1967 Mattel, Inc. U.S. Pat'd U.S. Pats. Pend Made in Taiwan. New box with clear cellophane front, new swimsuit; jacket of orange vinyl with yellow daisy heads, edged in yellow, over orange vinyl shorts and top. Hair color is still either; Golden Blonde or Java brown. Orange hair bows, white comb and brush, clear X stand, black eyelash brush. Doll mark: © 1967 Mattel, Inc. U.S. Pat'd U.S. Pats. Pend Made in Japan or Made in Taiwan. Bendable knees, elbows, swivel waist, neck, hands, arms and legs. Blonde hair tied in two pigtails with hot pink ribbons either; strawberry blonde or pale blonde, rooted eye lashes. Green, blue, pink one piece swimsuit, hot pink neck tie ring, clear X stand. Has a special pink trade-in box. Same as doll show on left, with a different box that says "Dramatic New Living Skipper", but this was not a trade-in doll. Same markings as 1147. Same doll, new blue box, new yellow swimsuit, orange skateboard, new two piece clear plastic stand and booklet. Same markings as above doll. This is a very hard to find doll, box and yellow swimsuit. Suntan skin, long straight blonde hair, bangs, twist waist, bend knees, painted eyelashes, two piece orange tricot swimsuit, blue towel and sunglasses. Doll same as 1972, with New mark change; Made in Japan to - Made in Korea. Doll same as 1974, new white box, no towel or sunglasses, rest the same as 1973-1974. Doll same as 1975, new rose box. There is a also a Japan only version of the Malibu Skipper who was called the Skipper Sun Sun doll, same blonde sun tanned doll, orange swimsuit, but packaging is written in Japanese. Same doll as above, only sold as a "baggie" in a clear plastic bag, stapled on cardboard header. This was a method to move old store stock. Same markings as above doll. Same doll as above, new pink box, new pink maxi dress, white crocheted shawl, pink comb, brush, white bead necklace, blonde tie on fall wig, same barrettes and ribbons, pink flat shoes. Chocho was not referred to as a friend of Barbie or Skipper, but does use the Skipper Deluxe Quick Curl body and hair. Came in blonde, brunette or titian pigtails. Wore either a red or hot pink satin dress, orange flat shoes and had cardboard yellow wings that a child could wear in her hair, additional accessories were; pink comb, brush and hair curler, green and yellow hair ribbons and two white barrettes. Growing up Skipper doll, was one of the most controversial dolls in 1975, just about every newspaper in the U.S.A. carried a story about her, some women's groups and a few parents wrote to complain, but with sales expected at 1 1/2 million, the doll must go on to market. She's 9" tall with long platinum or reddish blonde hair curled with a end flip. She's Two dolls in One" when you turn the left arm she grows a modest bust line, slimmer waist and becomes 3/4" taller. (turning the arm back again reverts to the previous shape and size doll). Included are a red headband, red body suit, blue collar, blue scarf, red socks, red flat shoes, white platform like wedgie sandals, two red and white plaid skirts; one short skirt and one long. Doll mark: © 1967 Mattel Inc. Hong Kong U.S. & For. Pat. 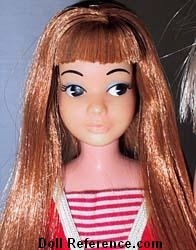 Growing Up Ginger doll is 9" tall and uses a Skipper head mold and the same construction as Growing Up Skipper, rotate her arms and she grows modest breasts and her waist slims and she becomes 3/4" taller. 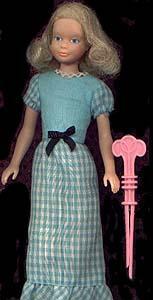 (turning the arm back again reverts to the previous shape doll), brunette long hair, brown eyes, blue body suit, a long and short blue and white polka dot skirt, lavender scarf, and collar, blue flat shoes and white platform shoes. Doll mark: © 1967 Mattel, Inc. Hong Kong U.S. & For. Pat. 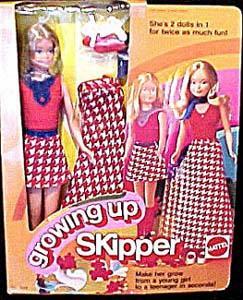 Note: Both the Skipper and Ginger doll boxes have a graphic drawing pictured on front, however, in 1975 Skipper had a picture of the actual doll. Shown on left; White solid box, one piece red, white blue swimsuit, gold medal, straight long blonde hair. Came in a blonde or brunette, has a twist waist, straight non-bending legs, wore a blue with white and pink flowers swimsuit with white attached little pleated skirt. White box, clear window, similar to Sunset Malibu only with pink skin, heavy eye makeup, long straight pale blonde hair, yellow two piece tricot swimsuit. Doll was only available in the European market. Has a twist waist and bendable legs, wore a two piece tricot navy blue swimsuit. 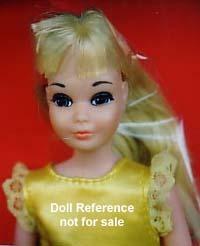 Came in a hot pink box with partial front cello, wore a yellow satin party dress with lace and ribbon trim, has a twist waist but her legs do not bend and are of a soft vinyl, she has long pale blonde rooted hair with bangs, rooted eyelashes, painted eyes, closed mouth. Unknown if shoes were included.